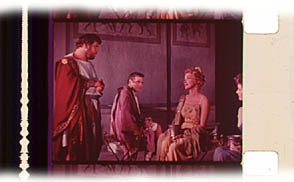 Illustrated above are frame scans taken from an original 16mm print of the 1960 feature film 'SPARTACUS' which exhibits typical colour fading. 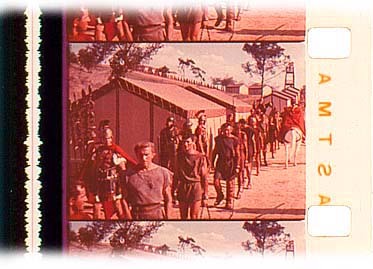 The film print stock used was Eastman 7381 manufactured in 1974. The green part of the colour dye spectrum of the emulsion can be seen to have faded, shifting the balance to the magenta. Some strong blues and yellows remain, while there is an overall loss of shadow intensity. 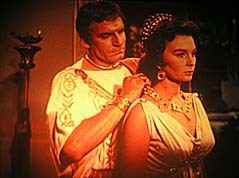 The film was first premiered in 70mm at 197 minutes, then reduced to 183 minutes for general and international release. 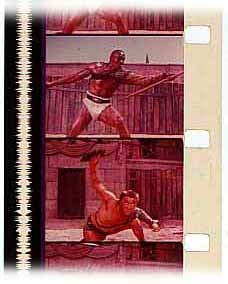 In 1967 a 'pan and scan' version for television was produced from the 70mm original negative which became accidentally scratched.